Thank you for your request. You should be contacted by a Lake Wales Arts Council staff member in 1-3 business days. Each artist must complete an individual on line application and submit all items on the checklist. Application packets must be electronically submitted by January 13, 2019. Jurying will take place on January 16, 2019. January 18, 2019 notice of acceptance will be emailed and posted on the Lake Wales Arts Council website www.lakewalesartscouncil.org. Complete an individual on-line application. Four images: Three of new individual art works and one of overall exhibit booth in .jpg. Jury Fee: $30 for each category entered paid through Zapp. Fees are non-refundable. Exhibit Booth Fee paid through Zapp due upon acceptance: $160 per exhibit space. Non-refundable upon acceptance. Artist must provide tent (10x10) and display racks that are strong enough to withstand winds. No staking down tents will be allowed. Securing tents should be done with weights. 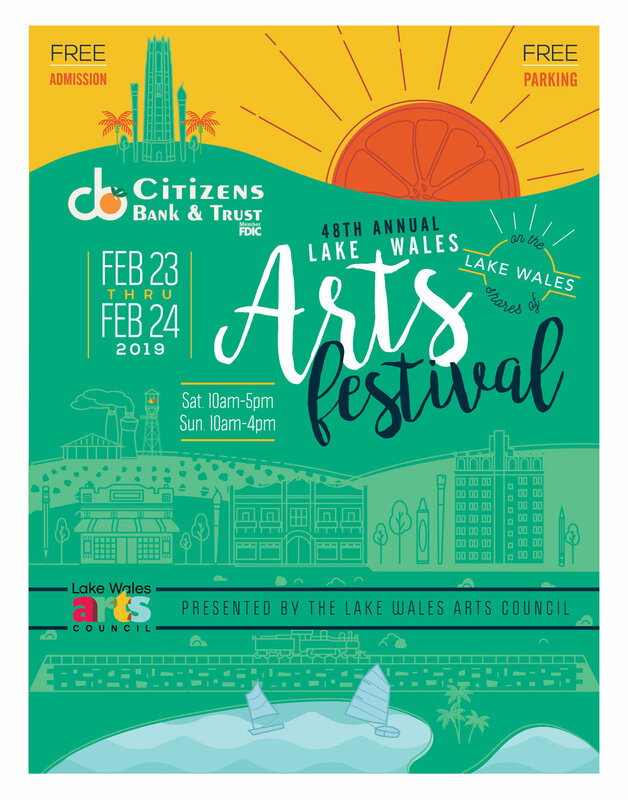 An anonymous panel of experienced jurors will select the artists for the Citizens Bank & Trust Lake Wales Arts Festival 2019. Jurying is based solely on the images submitted and acceptance will go to artists with the highest scores. A waiting list will be kept. Each year, awards selection is made by two different judges without regard to category. Thank you for completing the festival survey. Volunteers will pick them up at the end of the festival. Participation is limited to artists showing their OWN ORIGINAL WORKS OF ART created in the last three years. No kits, manufactured items, sea shells, T-shirts or other forms of manufactured clothing, molds, patterns or pre-determined art will be accepted. The committee reserves the right to remove any inappropriate exhibit or work of art which does not meet its standards without refund. Artists work must correspond to images submitted. No stand-in or proxy exhibitors will be allowed to represent the artist. Each artist is responsible for collecting and paying 7% Florida Sales Tax on all sales made during the show. An artist may apply to enter as many categories as desired but may only exhibit works in the categories accepted for this show. No refunds will be issued after the artist has been accepted. An accepted applicant has a commitment to participate in the festival. Photo identification will be verified at the registration desk. Exhibits must stay within the allotted space, approximately 10' x 10'. Only one exhibitor is permitted in each space. Exhibits must be in place by 9:30 am on Saturday, February 23 and remain in place until 4:00 pm on Sunday, February 24. In order to be considered for judging the booth identification must be placed on the top right of the booth front side. Artists must wear the name tag provided through the festival time. Exhibits must stay within the allotted space, approximately 10’ x 10’. Only one exhibitor permitted in each space. In order to be considered for judging, the booth identification must be placed on the top right front of the booth. Artist must provide tent and display racks that are strong enough to withstand winds. No staking down the tents will be allowed. Securing the tents should be done with weights.